From the Webmaster: More information requested. The President of the United States of America takes pleasure in presenting the Navy Cross to Lieutenant [then Lieutenant, Junior Grade] Franklin Edward Foltz, United States Naval Reserve, for extraordinary heroism in operations against the enemy while serving as Pilot of a carrier-based Navy Fighter Plane in Fighting Squadron EIGHTEEN (VF-18), attached to the U.S.S. INTREPID (CV-11), in action against major units of the Japanese Fleet during the Battle for Letye Gulf, on 24 and 26 October 1944. Diving through anti-aircraft fire of great intensity to carry out his attacks, Lieutenant Foltz strafed an enemy cruiser from stem to stern, neutralizing the ships anti-aircraft fire and reducing the opposition to our torpedo bombers. Attacking the enemy Fleet again, he dived from a high level through intense anti-aircraft fire of all calibers and scored a direct 500-pound bomb hit aft of the Number Three Turret on the battleship YAMATO, causing serious damage. His outstanding courage and determination in the face of great danger were in keeping with the highest traditions of the United States Naval Service. 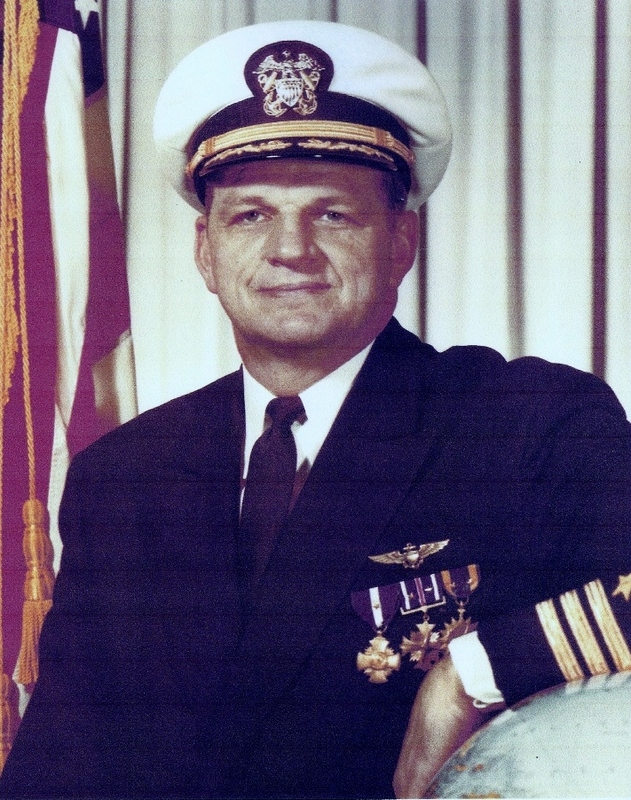 (9/1/14): NOTICE: "...I am attempting to contact Naval personnel that have first hand knowledge of my deceased father, Admiral Frank Edward Foltz. He served with the following units: 1943 USS Monterey VC-30; 1945 USS Intrepid VF-36 and VF-18; 1947 Aviation Arament Lab, Naval Air Development Center, Jacksonville, Florida; 1950 VX-3 NAS Atlantic City, New Jersey; 1952 General Line School, Monterey, Ca. ; 1953 ATU-200, NAS Kingsville, Texas CNAVANTRA; 1954 VF/VA-192, NAS Moffett Field, California; 1955 NAS Moffett Field, California, Fighter Squadron 192; 1957 BUWEPS REP El Segundo, Ca. Douglas A/C Co. Inc.; 1959 Air War College Maxwell AFB, ALA; 1960 NATTU; NAS Pensacola, Florida Photo Indoc, VF-174, NAS Cecil Field, Jacksonville, Florida; and 1961 VFP-62, NAS Cecil Field, Jacksonville, Florida, Commanding Officer. Anyone who served with and under my Fathers command please contact me. Thanks you very much Laura Lee Barrera (FOLTZ) lauraleebarrera@hotmail.com ." I was in VFP-62 in 1962 and 1963. I remember CMDR Foltz very well. I was an AT and I was assigned to the line division as a plane captain. CMDR Foltz was so big he could not strap himself into the cockpit. He had to have someone strap the left shoulder harness for him. I also remember him having a standing offer to Indian leg wrestle any two men on the base as long as their combined weight did not exceed 350 pounds. He was a really good skipper and was respected and very well liked by the entire squadron.